Variable message displays or DMS are the displays which used to show variable messages.These are generally used in public areas to show safety or public awareness message or are used on highway side for showing variable message related to public saftey or weather related information. LED Variable message Sign Display. This LED Display can be used in various locations, such as Company enterence, Roads On the building Facade, or even indoors. The LED Display is available in all sizes and colors. Variable Message Display Board are programmable displays that display messages composed of letters, symbols or both. 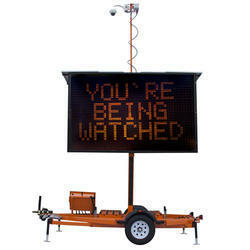 Variable Message Signs are widely applicable to highway and traffic control equipment.